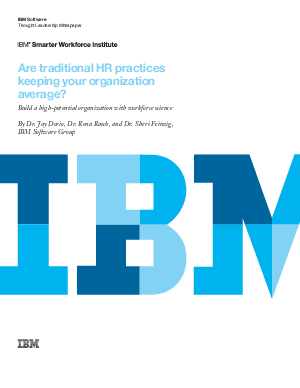 > IBM > Are Traditional HR Practices Keeping Your Organization Average? Ever since the publication of the War for Talent in 1997, the stakes for getting things right have been high…and they continue to be a top priority for CEOs (IBM Institute for Business Value, 2013). However, an over-reliance on traditional methods across critical human capital management processes may be limiting effectiveness.